Imagination Playground @ The Hullabaloo is on from the 11th May to 13th June, especially for ages 2+. Specially commissioned play installations are a core part of The Hullabaloo ethos and are part of the free activities offered at the venue for families to enjoy. You can find them in the wonderful Gillian Dickinson Creative Play space right at the heart of the venue. There is no need to book but at busy times there may be a short wait. Imagination Playground is child-centred and encourages self-expression through free play. 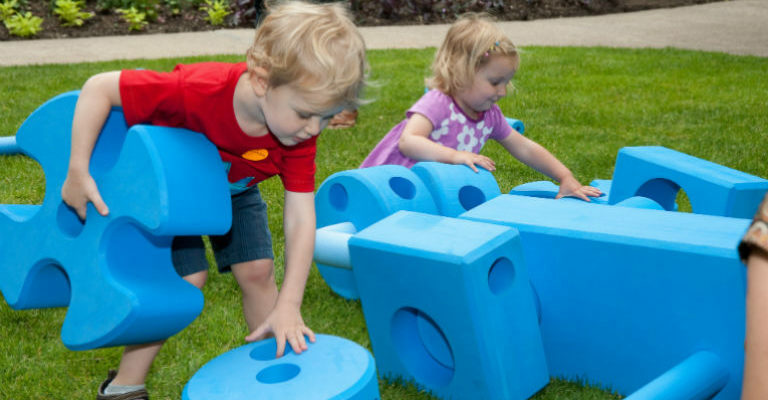 The playground is comprised of large blue foam bricks in a variety of shapes and sizes enabling children to transform their environment and create a play space of their own. Children can create their own world everyday, inspiring the children to design their own inventions. Children love it. Come along and imagine, invent, collaborate and play. What will you build – a castle, a rocket, a tunnel, a den – the possibilities are endless. Go wild, let your imagination be your guide, and invent your own games in your space. There are no rules here for what you create! The story also has ideas for developing oracy through rhyme and repetition. In particular, this piece also includes subjects such as size and shape, generosity, giving and sharing. This re-telling of the old favourite contains all the elements of Intext’s previous shows. Vivid storytelling, the use of simple props to stimulate the children’s imagination, and audience participation are all included here. The story also brings together characters from other famous traditional fairytales and has good links to KS1 literacy. It uses speaking and listening, simple rhymes and repeated phrases. In addition to this, the piece looks at subjects such as size and shape, generosity, helping and sharing. Meet a clever princess, a clumsy prince, and a wicked witch who can’t stand to see anyone else having fun. Princess Rapunzel has never EVER had her hair cut. Even though she is 16 and about to have a birthday party. But in the middle of the celebrations, the jealous witch spoils all of the fun for everyone…including Rapunzel and her hair! Into thick pouring rain, so you’d never be dry. Her fingers went click, they all started to cry. Learn how Rapunzel is trapped at the top of a tall tower, and how she manages to escape and rescue the prince in this new retelling of the favourite fairytale. Please note that whilst babies under 12 months are free, a ticket is still required. Please contact the Box Office on 01325 405 405.